Though it is a widely used term among dentists and patients, it still creates an anxiety among the patients and often scare them. It can be treated easily with the latest Japanese Technology by highly trained and skillful dentists without causing any pain or discomfort to the patients. 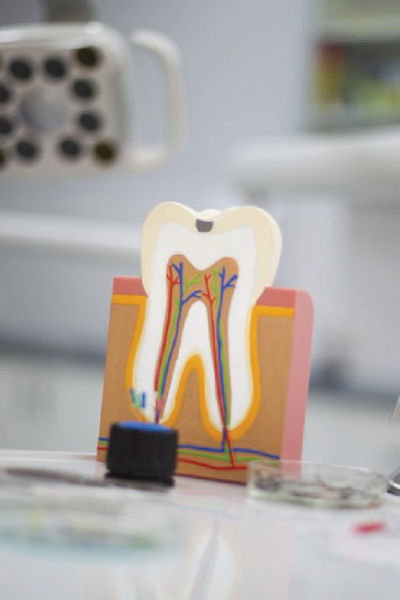 Painless Root Canal Treatment is the removal of an infected soft tissue which is an irreversibly damaged pulp within the tooth and its replacement by an artificial inert filling. It is a highly recommended technique for retaining the original tooth while giving the stability and the relief from unwanted pain. Prof. Dr. Kapil Khullar has extensive training in the technology and a vast experience of 21 years in endodontics and root canal treatment. The treatment can be effectively completed within 30 minutes. Depending on the patient’s need, suitable and adequate local anesthesia is administered to make the treatment even more comfortable. We have been awarded the best for Root Canal Treatment in Gurgaon several times over the years. Dr. Khullar’s Dental Clinic is also known to be of the best dental clinic in Gurgaon for the convenient most treatments and after care provided by the dentists. Rotary endodontics is the concept of removing infection from root canals which is revolutionized by using the latest Japanese Technology driven Endo Motor, Rotary Files and RVG(Radiovisiography) which makes it possible for the therapy to be completed in Single Sitting (30 minutes) in a totally painless procedure. This treatment not only produces excellent results with higher longevity,but is also preferred for patients with anxiety issues as there is no use of Injections. This device used in endodontics to determine the position of the apical foramen and thus determine the length of the root canal space. This helps in attaining high precision results in the root canal treatment. Dr. Khullar’s Dental Clinic is equipped with RVG for immediate image preview and availability for patient files. This technique helps in saving time and money. We use RVG detectors from world’s leading German Manufacturer SCHICK Gmbh which ensures 99% less radiation exposure than conventional X ray machines. Multiple Procedures to suit every patient’s needs and expectations. Best standards of Sterilization and Infection Control with Autoclave Technology. Our dentist specialises in Single Sitting Painless Root Canal Treatment in Gurgaon and are pioneers in the use of the most modern technology. We offer Root Canal Treatment in Gurgaon, DLF Phase 5, Naraina Vihar, Golf Course Road, Sohna Road for some of the most complex cases. If you are looking for a painfree experience, contact our guest relationship manager today.